Last weekend was a weekend of all weathers. The sun chose to shine while I was accompanying Garden Girl to a birthday party but after that we had rain, sleet and even snow. For all the motivation I had, opening the door and heading out into the garden was a task not to be. Determined to remain motivated, I drew a plan of the garden, marking out where each of the seeds will be sown. I also started to put together a monthly list of things to do, which I will pop up here each month. I wanted a list that I could use again each year and which would be specifically relevant to my garden and the things we grow. I had a couple of opportunities during the week to pop out and sow broad beans but these were during the school day and whilst I often do work in the garden during this time I did not want to exclude our Little Garden Helpers from the very first sowings of the year. Thankfully, today has been perfect for a day in the garden and we made the most of it. Our three Little Garden Helpers delighted in helping with the first sowings of the year, measuring out the distance between beans and pushing the beans themselves into the soil, before covering them up and watering them. Garden Lass eagerly joined in and when she had run out of beans she continued to happily push stones from the pathway into the raised bed. This was in total opposite to last year, when she happily spent her time scooping soil from the raised bed onto the pathway! I was also able to weed the herb bed, which is always hard work because of all the weeds tangling themselves around the thyme and oregano. Those that grow up through the middle of these woody herbs should perhaps be admired for their persistence but it is frustratingly difficult to get at their roots without pulling up the thyme and oregano as well. And then there is all the moss growing at the shady end of the bed which I am never quite certain whether I should totally remove or just break up and dig in. I usually end up going for a bit of a mix of the two. While I was working my way along the herb bed I was disappointed to find so many snails, nestled and sheltered by the herbs, undisturbed over winter. I removed as many as I could but I am sure there are more hiding in the warmth of the low growing herbs. Our Little Garden Helpers had the opportunity to see a variety of different snail shells however, and one brave little snail tried to make an escape from my bucket and gave them a delightful peek at its body and antennae as it tried to slither slowly away. 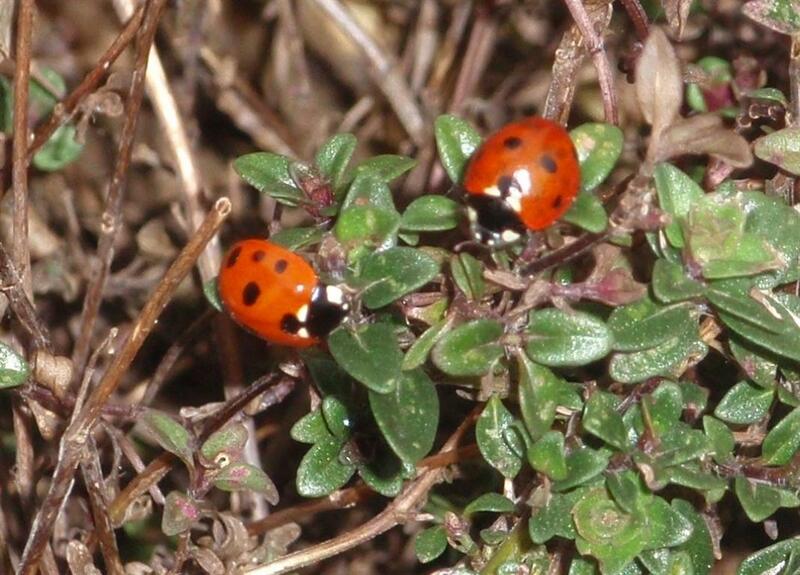 On a more pleasing note I saw a lot of seven spotted ladybirds and not a single harlequin. I'm not sure if this is because the latter species tend to come out later in the year but I am taking it as a good sign that there are so many seven spotted ones in the garden at the moment. And our Little Garden Helpers were absolutely thrilled to see one of them residing in the ladybird house we put up last year. I have never had much success getting my little ones to help with weeding so while I was busy pulling up unwanted green things, our Little Garden Helpers were playing hide and seek amongst the plant pots and having watering can races. I'm not sure how a watering can race works but it involved running about with a watering can, getting wet and lots of laughter! We came inside for dinner, wet but satisfied with our day in the garden.